Broan Nutone 70 CFM, 3.5 Sones Fan/Light. Type IC. Broan 688 Fan is a household fan for exhaust ventilation, providing high performance with low noise. It features a powerful engine and a centrifugal blower wheel that provide efficient ventilation at 50 CFM. It is suitable for ceiling or wall mounting, and its compact size allows for easy installation. The fan grille is made of ABS plastic. Available color: white. There are 1,223 items available. Please enter a number less than or equal to 1,223. Got to me before the the time . Great service . exactly as described. Great Price, Great Quality, and Quick Shipping! Though I did not install this unit in a closed wall/ceiling, it looks like it would be very easy to do; I recently replaced the motor in an old bathroom unit that is nearly identical to this and that replacement motor cost more than this whole unit. The effort to engineer a quality affordable product is evident. It's lightweight at 3.5 lbs, moves a surprising amount of air (rated 50 CFM) and sound level is noticeable but not annoyingly loud. For my application (venting a tiny greenhouse), it doesn't move quite enough air so I've ordered an 80 CFM unit (at considerably higher cost). 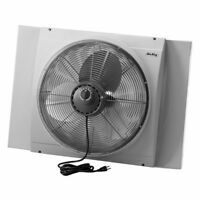 I considered just buying/installing a 2nd one of these but the 80 CFM unit I ordered runs on 1/3 the electricity of one of these and, for a bonus, is quieter, too. For venting a small space on a tight budget, I think this is a quality product at an incredible price! My search was for solar powered exhaust fans. This product appeared to fit my need and it was ordered. Inspection of the product revealed there was absolutely NOTHING SOLAR POWERED about this product. 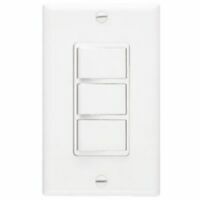 It is a typical electrical plug in-ceiling bathroom type exhaust fan. It is a good value and quality bathroom electrically powered exhaust fan if that is what you need. this fan was purchased to replace 25 year old broan fans that were still working, but made a LOT of noise. I was concerned that 4 sones may not be any quieter than what i had, but it is SO much quieter. Installation was quick and simple, didn't have to install the entire box, just unplug the old fan, put in the new fan and pop on the new cover, could not have been easier! Not expensive and lasts forever. I have bought a second unit for my basement bathroom. This unit is a little bit noisier than some, but I like the fan noise. No one wants to be heard going to the bathroom... also it's nice and high powered. I recommend to anyone on a budges and wants a good vent for their bathroom or any room for that matter! Just now replacing one of these after 20 years of hard use. During those 20 years, I took the fan component out a couple of times a year and cleaned all the dust off and oiled. Put it back in and it ran like new. After 20 years, the shaft is wearing and it wobbles making it noisy. Inexpensive replacement.